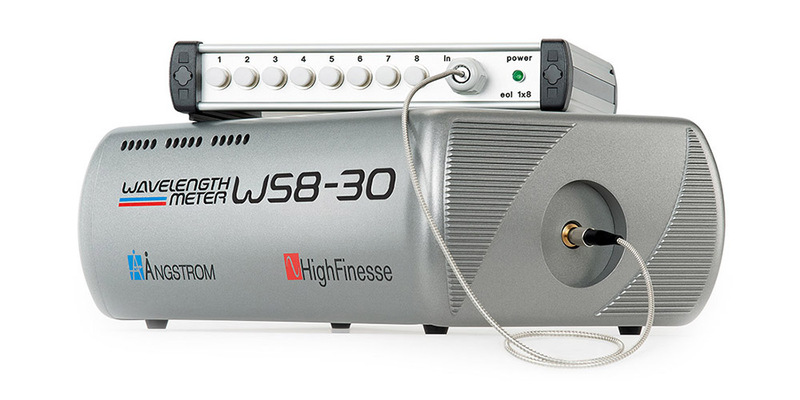 The HighFinesse/Ångstrom WS8-30 is a high-end instrument for wavelength measurement of pulsed or continuous laser sources. It delivers excellent absolute and relative accuracy required by cutting-edge scientific research, as well as industrial and medical applications. The photonic fiber switch at the input offers endlessly singlemode operation, making it possible to measure lasers at wavelengths across the entire spectrum with the full accuracy of the wavelength meter. The WS8 is connected to the PC via a USB interface and is ready for use as soon as the software delivered with the device is installed. The design enables the integration of additional options, allowing customized solutions to specific applications. The WS8-30 is one of our high-end solutions for wavelength monitoring and control with an absolute accuracy of 30 MHz and a wavelength deviation sensitivity of 1 MHz. It perfectly combines with the photonic crystal fiber technology enabling multichannel operation in the spectral range of the wavelength meter. The 30 MHz presumes, that the device is supported by one of our calibration sources. Standard HighFinesse wavelength meters up to an absolute accuracy of 60 MHz feature autocalibration via an integrated calibration source. This guarantees the accuracy and stability of measurements with our wavelength meters. For the higher accuracies we offer a variety of frequency stabilized, narrow linewidth, laser sources with up to ± 10 kHz frequency stability for different applications. HighFinesse offers the The WS8-series as compact device, standalone device, in a 19-Inch rack-mount case or customized to your needs. The WS8-30-series is also available in a low power sensitivity which offers increased sensitivity to the input light. Please contact HighFinesse for further information.